Join us for 8-10 hours aboard the our vessel cruising the majestic Blue Pacific Ocean. Only minutes from your Waikiki Hotel in Kewalo Basin. Start your adventure at around 6am and join us in search of pelagic fish ranging from 5lbs to over 500lbs! Reel in mahi mahi, ono, tuna and possibly even the Powerful Pacific Blue Marlin! 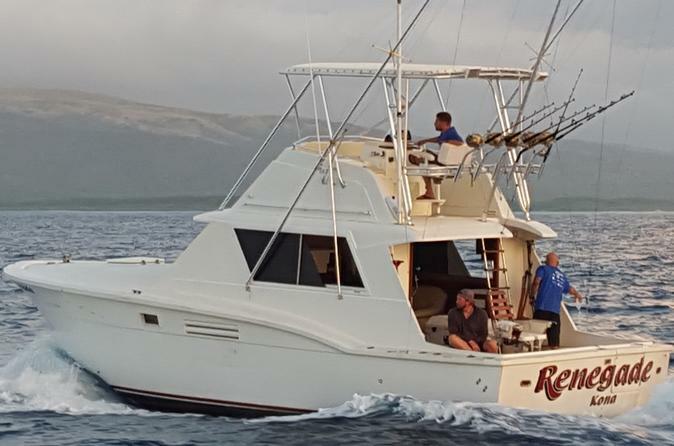 Jump aboard our Hawaiian Custom Built 39' Force Fishing Machine (Waikiki) which can take up to 10 people fishing, or our 38' Honolulu fishing charter boat for private groups up to 6 anglers. Both boats are USCG certified. Let our experienced crew make your Hawaii fishing adventure a truly memorable one. From private Kaneohe fishing charters to larger groups, we handle all the details. Just sit back, relax and wait for the strike.